At Haworth, in 1986, a carte de visite (small photo on paper) of the same image was discovered amongst a bequest to the Bronte Museum from a reliable source. This photo had "within a year of CB's death" written on the reverse so it appeared to confirm identification as Charlotte. It seemed genuine but was the result of an error made decades earlier. The photo at the NPG was a copy made c1918 by the photographer, Emery Walker, from the carte de visite photo (now at Haworth) which was then (c1918) privately owned. At the BPM is another copy of the carte de visite photo from another source with "Ellen Nussey" written on the reverse. This is a portrait of Ellen Nussey (1817-97), taken "within a year of CB's death" and not a portrait of Charlotte Bronte. 1. LEFT:The profile photograph. RIGHT: A photo of Ellen Nussey. LEFT: Audrey Hall's photo. RIGHT: Photo of Ellen Nussey, aged 54. 2. In the early 1990s a photo was discovered by Audrey Hall. It was amongst items originally purchased when the contents of Ellen Nussey's home were sold in the 1890s. Audrey thought this was a photo of Charlotte Bronte because of the resemblance to the lady in the profile photo. The research into the photo was filmed and can be seen in the very interesting BBC documentary Charlotte Bronte Unmasked (1995). Tests were carried out using forensic technology and this appeared to confirm that the two photos were of the same lady. 3. 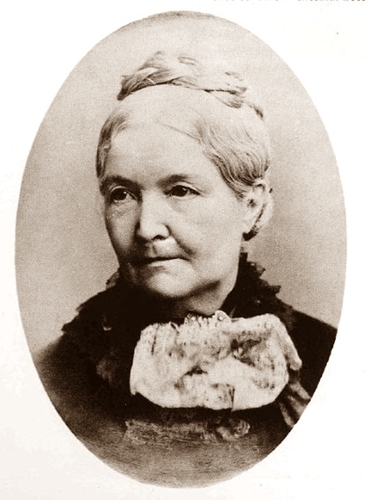 Photo of Ellen Nussey (1817-97) thought to have been taken c1882, aged about 65. 5. 1. See article by Claire Harman 30 September 2015 in The Times Literary Supplement and Charlotte Brontë: A Life by Claire Harman. 2. Photo of Ellen Nussey dated 29 April 1871, just after her 54th birthday. At the edge of the glass negative the photographer has etched "29.4.71 E.N.". See this external website for a clearer image: In Search Of Anne Bronte by Nick Holland. The date is reversed because it is etched into the collodion surface; the photo is correctly oriented. In some photos her hair may have been augmented with a hair piece. The comparisons and forensic evidence for Audrey Hall's photo was never accepted. 4. See also the "Chalk portrait of Charlotte Bronte." 5. 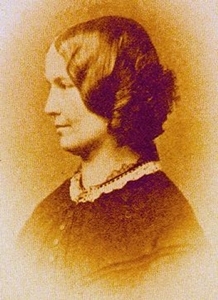 The photo was copied as a pencil sketch which was published in Charlotte Bronte at Home (1899) with the caption "ELLEN NUSSEY (AT THE AGE OF 65) From a drawing by Miss E. Taylor."